Credit: NASA/CXC/Penn State/S. Immler et al. A series of Chandra observations of the spiral galaxy NGC 1637 has provided a dramatic view of a violent, restless nature that belies its serene optical image. Over a span of 21 months, intense neutron star and black hole X-ray sources flashed on and off, giving the galaxy the appearance of a cosmic Christmas tree. Erratic, volatile behavior is a common characteristic of neutron stars or black holes with orbiting normal companion stars. Gas ripped off the normal star falls toward the compact star where the gas is compressed and heated by gravitational fields billions of times stronger than on the surface of the Sun. This process generates powerful X-radiation that can flare up and subside in a matter of seconds. The X-ray view is in marked contrast to the view with an optical telescope. Optically, the galaxy is a stately spiral lit by the glow of about fifty billion stars slowly evolving over millions and billions of years. This tranquil scene is interrupted about once a century with a supernova that signals the death of a star, and in many cases the formation of a neutron star or black hole. It was the detection of such a supernova in 1999 that triggered the subsequent series of Chandra observations. 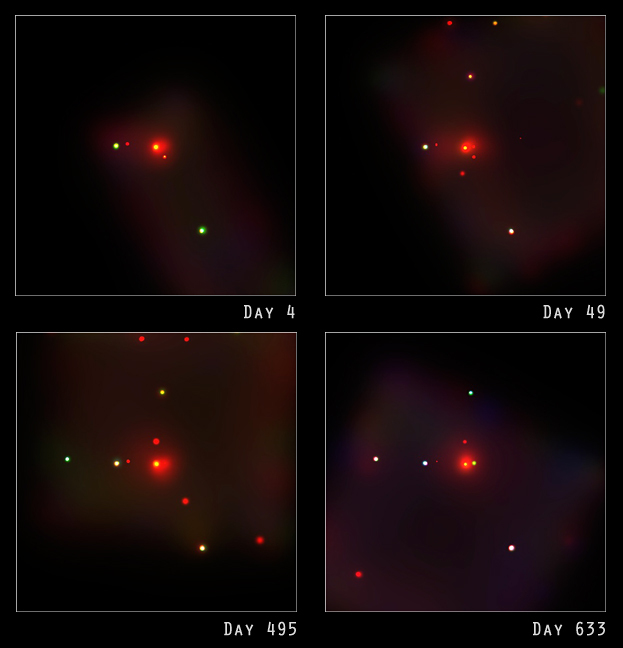 The supernova appears in the panels on days 4 and 49 as the faint source at the five o'clock position just below the diffuse glow in the center of the image. The supernova faded in a few months, but the Chandra observations continued on five more occasions in coordination with the Hubble Space Telescope and the Very Large Array radio telescope. This collaboration produced a valuable data set of long term radio, optical and X-ray observations of the galaxy. Of particular note is an extremely bright (white) X-ray source that appears in all panels at the nine o'clock position. This source is located in a group of massive stars in one of the outer spiral arms of the galaxy. It is likely a black hole formed relatively recently (in the last million years or so) when a massive star exhausted its nuclear fuel, exploded as a supernova and left behind a black hole which is now pulling in gas from a companion star. Credit NASA/CXC/Penn State/S. Immler et al. Scale Each panel is 8.5 arcmin per side. Coordinates (J2000) RA 04h 41m 27.10s | Dec -02° 51’ 45.70"
References S. Immler et al. Ap. J. 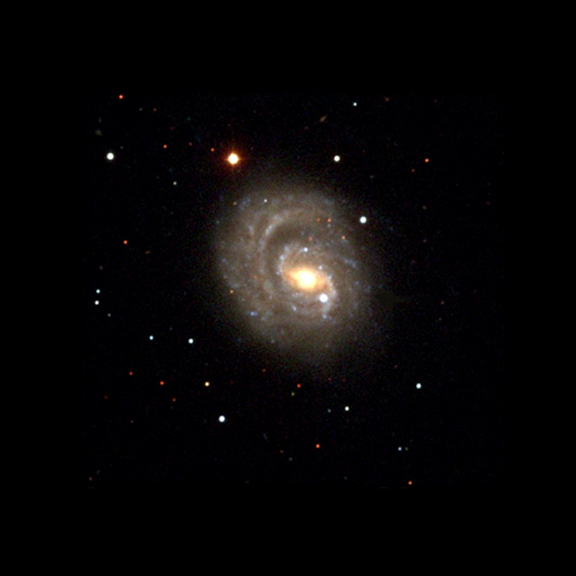 595, 727 (2003 October 1) "A Deep Chandra X-ray Observation of NGC 1637"